This was such a special visit. 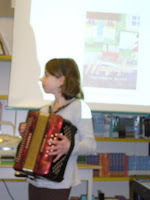 I lug the little student accordion that I traded my mother's old wheezy one for to almost every presentation. Just for show. And I always ask if there is someone who might be able to play it, since I can't. This time, at Confederation Park in Burnaby, we were all in for a surprise. One of the students seems to have the knack of it and played the theme song from "Star Wars" as part of her repetoire. It was a great night, I signed books in the parking lot under a cold, starry sky because it was after 9 and the school had to close. 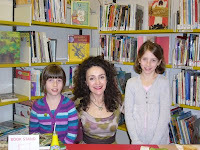 I am very glad I met so many book lovers from Confederation Park--parents, staff and kids-- many of whom have a knack for telling a good accordion story of their own!